As the weather turns and the nights draw in, celebrations such as Halloween and Bonfire Night get us in the mood for warming comfort food to see us through the chilly evenings. However you plan to celebrate the day, whether in your own garden, at a public display or at the famous spectacles in Lewes or Ottery St. Mary, this recipe collection will inspire you with some brilliant bonfire night recipes to cook for friends and family. For those cooking up a storm for a bonfire this year, we have plenty to keep the cockles warmed. Marcus Wareing's Cheeseburger with caramelised onions recipe is a proper crowd-pleaser for such an event, or fill up a thermos with a seasonal soup such as Sally Abé's Broccoli and Stilton soup recipe. Make-and-go treats such as sausage rolls are also a good option – try Georgina Fuggle's stunning pork and apricot version for a luxurious homemade snack, or for a sweet treat, Shaun Rankin's Apple muffin recipe will keep the whole family happy when watching the fireworks. If you're hosting a dinner party this bonfire night, we have also included a set of suitably fiery recipes to keep your guests happy. Adam Byatt's flaming Cottage pie recipe is finished with flourish at the table, setting rosemary alight in a piece of bone marrow to wow your guests. 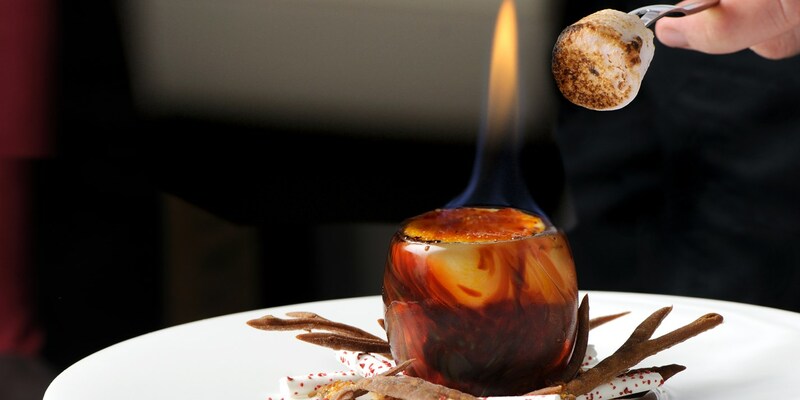 Paul Ainsworth’s fun toffee apple and marshmallow kebabs should bring back memories of smoky bonfires and sticky treats, while Simon Hulstone's 'Campfire and marshmallows' offers a truly gastronomic take on the night.